Happy Valentine’s Day to all the lovebirds out there . . . and most importantly to my beautiful hubby. This is what I was planning to wear today – Parisian chic with a twist and a bit of obligatory red to suit the day – but the weather in Melbourne has gone crazy and I found it too hot and sticky. I love waking up to a thunderstorm and rain and this morning I thought I’d been transported to tropical Queensland. But just as suddenly as the storm arrived . . . it rapidly evaporated leaving us with sun, cloud and humidity – every fashionista’s worst nightmare! Oh the hair, the hair has gone crazy. Going for a run this morning didn’t help things either. Love the lace on this Valleygirl top – very suited to Valentine’s Day. These blue and white pinstriped Ally shorts have been hanging around my wardrobe for a long time. I’ve paired them with a white lace cami and red shoe-boots. I was strutting around Brighton a couple of years ago with these striking shoe-boots over my leather jeans and the Brighton ladies were literally staring at them. Nothing like this was around then (yep, it was another God thing; he’s way ahead) but there have since been many similar reinventions, particularly on the international catwalks. 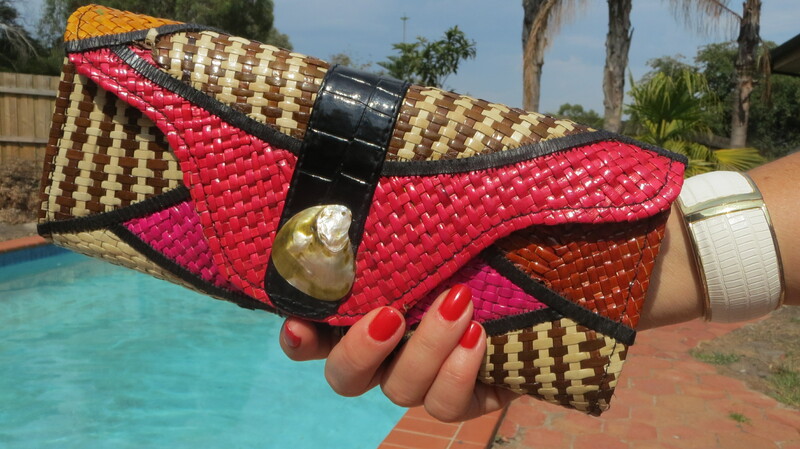 Found this colorful raffia clutch in an op shop last summer and couldn’t believe my eyes! About a month later Burberry Prorsum, Calvin Klein and other high-end designers released four-figure raffia clutches. I hope you all have a fantastic Valentine’s Day and are spoilt with roses, chocolates and lots of other goodies. And now you’re Looking Good Girls! “Solomon’s Finest Song. Oh, that he would kiss me with the kisses of his mouth! For your love is more delightful than wine. The fragrance of your perfume is intoxicating . . . ” Song of Solomon 1:1-3. NOTHING wrong with that hair!!! Just a bit of a hot blanket!